Memorial Day is an opportunity to say thank you to those who served the country and died in military service. It’s a special occasion when all the people take out time to honor the brave soldiers, airmen, sailors and marines who sacrificed their life for the nation. In the honor of national heroes, you can send Memorial Day greetings to your friends and family members. Exchanging Memorial Day wishes is an expression of respect and gratitude paid to the families of soldiers. While sending a Memorial Day card, you must be very careful about the color, size, design, font and other elements of the card. At greeting design studio, we give you an option to choose from an extensive range of happy Memorial Day templates to design a card of your choice. 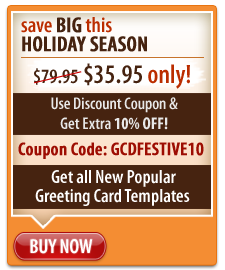 The greeting card software makes it easy for you to design a card without spending a big chunk of money. Use colors that exhibit patriotic feelings. Use simple fonts that match with the patriotic theme. Choose symbols and clip arts that makes the Memorial Day greeting cards look more appealing and visually striking. The greeting card making software enables you to design graceful Happy Memorial Day cards that can be published in different formats. You can either print these cards or send them via email. The software also enables you to instantly share your e-cards on Picasa and Facebook. So, get your copy of software now and create memorable greetings for your loved ones.